More flowers are in bloom on the summer solstice than on any other day of the year, and summer brides can capitalize on this floral bounty with the wide range of fragrant and affordable wedding flowers available. Not only are these flowers most affordable and lush during June, July, and August, you may also expect to see some of these flowers in bloom if you have an outdoor garden wedding. The trumpet-shaped blooms of the lily stand for purity, whether or not white flowers are used. The Oriental lilies of late summer have a strong fragrance and larger blooms than the Asiatic lilies of early summer. 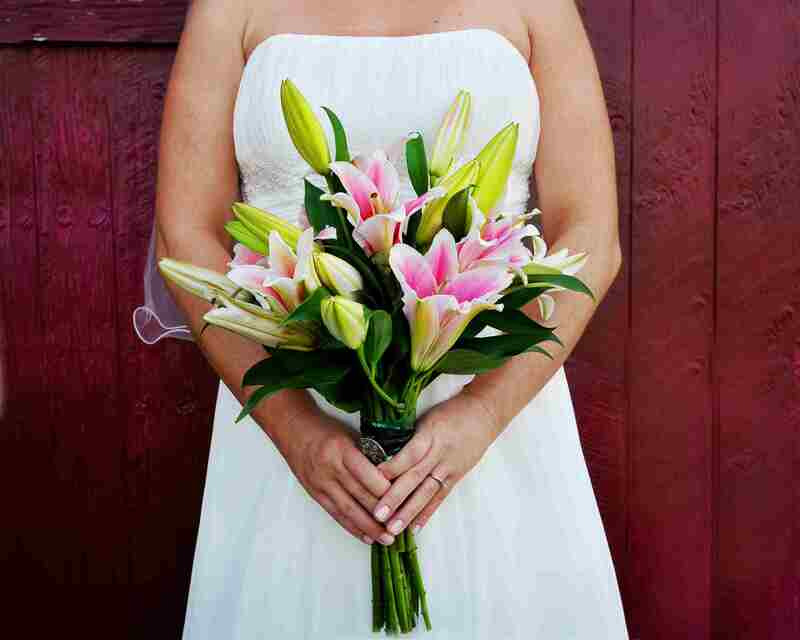 A wedding bouquet comprised entirely of lilies looks contemporary and dramatic, but lilies also pair well with other flowers like roses or lisianthus. The cheer and innocence of daisies pair well with yellow flowers that pick up the golden tones of a daisy’s center, like yellow roses or Asiatic lilies. The strong circular shape of daisies makes a striking pomander arrangement to hang from your pew ends. No other flower smells like lavender, and brides should be familiar with the scent before choosing lavender for a bouquet. The flowers make a good choice for scattering from a flower girl’s basket, and they make excellent dried flowers for a keepsake sachet after the ceremony. The awkward sounding name of this bloom derives from Greek, and means “love flower.” Most often available in shades of blue or sometimes white, these delicate flower clusters add volume without density to table centerpieces. The four-foot-long spikes of delphinium flowers come in all shades of blue from powder to cobalt and navy. White and pink varieties are also available. Brides can incorporate delphinium flowers into ceremony or reception arrangements, as well as arm sheaf bouquets. Hydrangeas are a short-lived wedding flower, lasting five to seven days, but popular with brides nevertheless. The white, blue, and pink blossom clusters can be as large as a softball, providing mass and volume from a few stems. The fragrance of hydrangeas is very light, making them suitable as cake toppers. Brides looking for vertical drama in every shade except blue should consider the gladiolus. A single flower spike can sport more than two dozen blooms, often with fancy ruffled edges. Gladiolus flowers are very thirsty, taking up large amounts of water in the vase, but make sure the water hasn’t been treated with fluoride, as this can cause the flowers and foliage to discolor. Liatris is a North American native flower that blooms late in the summer. Brides who choose pink or white wedding flowers can add the feathery Liatris blossom for vertical accents. These flowers open from the top downwards, so florists can tuck the unopened florets deeper into the arrangement to maintain a neater appearance. Also known as Texan bluebell, the lisianthus is the answer for brides who want a strong purple hue in a rose-like flower. One lisianthus stem may have several blooms so that a few stems will add bulk and density to a wedding bouquet. You may ask your florist for the botanical name of this flower, scabiosa, to avoid confusion with the pincushion protea flower. Pincushion flowers are commonly available in shades of blue, pink, and white, but the deep burgundy hue looks outstanding with white or green flowers. These flower clusters come in a rainbow of red, orange, pink, purple, and white. The flowers are an inexpensive way to add mass to bouquets and table arrangements. Snapdragons always want to be upright, and they will bend their tips toward the ceiling if you lay your bouquet on a chair during your reception. Blooming in early summer, yarrow comes in yellow tones, as well as white, pink, and red. The fern-like foliage is attractive as well as a fragrant addition to wedding flower arrangements. Brides should take some of their yarrow-containing flower arrangements home to grace their tables, as the cut flowers can last as long as three weeks. The flowers dry very well if you hang them upside down in a dry area for two weeks.